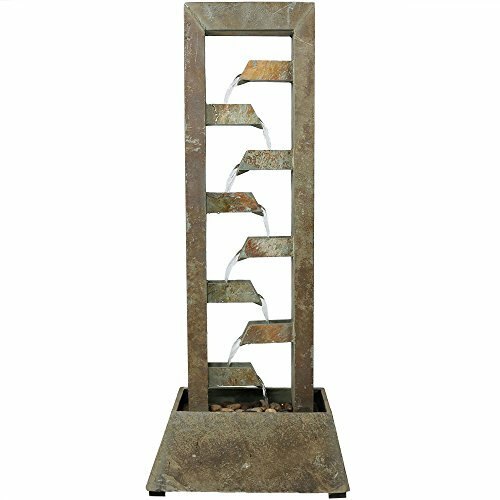 Sunnydaze Stacked Slate Freestanding Garden Water Fountain, 49 Inch Tall | Fountain City Art Ctr. This outdoor freestanding water fountain will add Zen and tranquility to your garden, patio or yard. Water flows from the top level and flows down the line to the basin in the bottom where it recirculates through the fountain. You will be instantly soothed as the sounds of the water falling drowns out unruly background noises. Plus, no plumbing is required, simply plug the fountain into a standard electrical outlet when you are ready for it to run. Overall dimensions: 20 inches wide x 12 inches deep x 49 inches tall; weighs 98 pounds, so it is stable and welcoming in any outdoor space. Fountain is made from natural slate for long-lasting natural beauty, strength and stability. No plumbing is required, simply plug the fountain into a standard electrical outlet when you have it filled and ready to run. Water flows from the top down to the basin and recirculates through the fountain.